I've been attempting some Tweetorials on Infinity. For those who would like more than can be expressed in 140 characters (a tough medium to talk about the infinite) here is an account of why there are different infinities. The very concept of number illustrates the power of the human mind to abstract mathematical identity from physically very different settings. In fact we seem genetically programmed to be able to detect when things are numerically identical or not. The decision to fight or fly in the face of the enemy depends on an assessment of whether the number in your pack is bigger or smaller than the number in the opposition. Those that can count, survive. This ability of animals to detect numerical identity has been identified in many species. Monkeys, cats and dogs count their young to check they are all there; coots can identify when the number of eggs in their nest has increased indicating someone has added a parasite egg; babies as young as 5 months can tell when dolls are taken away from a pile. Even dogs seem to be able to tell that something fishy is going on when experimenters try to trick them into thinking that 1+1=3. But it is humans who have given names to these numerical identities. Some tribes have only produced names for the first few numbers, lumping together anything too large under the heading “lots”. But even without names for numbers, such tribes are able to compare wealth. The tribe who has numbers “one, two, three, lots” can still say when one member of the tribe has more “lots” than another. If chickens are a mark of wealth then by pairing chickens up we can tell whether one person’s “lots” is bigger than another’s. This idea of comparison lead to mathematicians in the nineteenth century realising that even in our more sophisticated mathematical tribe we could actually compare infinities and say when two infinite sets are identical in size or not. Prior to the nineteenth century this idea of different sizes of infinity had never been considered. In fact when the German mathematician Georg Cantor proposed the idea in the 1870s, it was considered as almost heretical or at best the thoughts of a madman. Using the idea of pairing objects, Cantor was able to propose a way of declaring when two infinite sets were numerically identical or not. For example one might be tempted to declare that there are half as many even numbers as compared to all numbers. However Cantor showed there is a way to line up both sets of numbers so that each number has its pair. 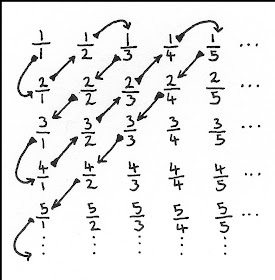 For example 1 gets paired with 2, 2 with 4, 3 with 6, and n with 2n. So these two sets have the same size. The tribal member with even numbered chickens is as wealthy as the tribesman with chickens numbered with all whole numbers. These infinite sets are identical in size. How then do you pair up the whole numbers with the fractions in this table? The trick is to wend a snake diagonally through the fractions in the table as illustrated below. The number 9 for example gets paired with 2/3, the ninth fraction that one meets as the snake slithers through the table of fractions. Since the snake covers the whole table, every fraction will get paired with some whole number. Why can we be sure that however hard he tries to match up chickens we can always guarantee an irrational chicken unaccounted for? Let's take one of his attempts to match his chickens with the irrational chickens belonging to the big cheese. We are going to build a number with an infinite decimal expansion such that the corresponding irrational chicken has not been paired up with one of the whole numbers. Each decimal place is a number between 0 and 9. In the first decimal place, we choose a number which is different from the first decimal place of the number paired with chicken number 1. In the second decimal place choose a number different from the second decimal place of the number paired with chicken number 2. For example the irrational chicken with number starting 0.28518… is not paired with the first five whole numbers. In this way we can build up a number labelling a chicken which hasn't been paired up with any whole number. If someone claimed it was the chicken paired with say chicken number 101, we could simply say: "check the 101st decimal place, it's different from the 101st decimal of this new number". There are a few technical points to watch in building this number, for example you don't want to produce the number 0.9999… because this is actually the same as the number 1.000… But the essence of the argument suffices to show that there are more numbers with infinite decimal expansions than there are whole numbers. 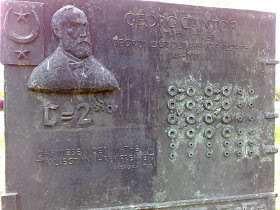 The great German mathematician David Hilbert recognized that Cantor was creating a genuinely new mathematics. Hilbert declared Cantor's ideas on infinities to be "the most astonishing product of mathematical thought, one of the most beautiful realisations of human activity in the domain of the purely intelligible…no one shall expel us from the paradise which Cantor has created for us". Cantor’s illumination of the different mathematical identities hiding inside the idea of infinity lead to a question that would reveal how subtle numbers are. Cantor wanted to know whether there are sets of numbers which are bigger in size than whole numbers but small enough that they can't be paired with all infinite decimal expansions. In other words can there be a tribal member with numbered chickens that is richer than the man with chickens labelled with whole numbers but poorer than the big cheese with chickens labelled with every possible infinite decimal expansion. The answer to this problem, which finally arrived in the 1960s, rocked the mathematical community to its foundations. Paul Cohen, a logician at Stanford, discovered that both answers were possible. Cohen proved that one couldn't prove from the axioms we currently use for mathematics whether or not there was a set of numbers whose size was strictly between the number of whole numbers and all real numbers. Indeed he produced two different models which satisfied the axioms that we are using for mathematics and in one model the answer to Cantor's question was "yes" and in the second model the answer was "no". Before Cantor, all infinities had been lumped together under one heading. But Cantor was able to distinguish different sizes of infinities. This feature of mathematics to distinguish different mathematical identities is very much a product of nineteenth century movement in mathematics towards looking for abstract mathematical structures underlying physical reality.